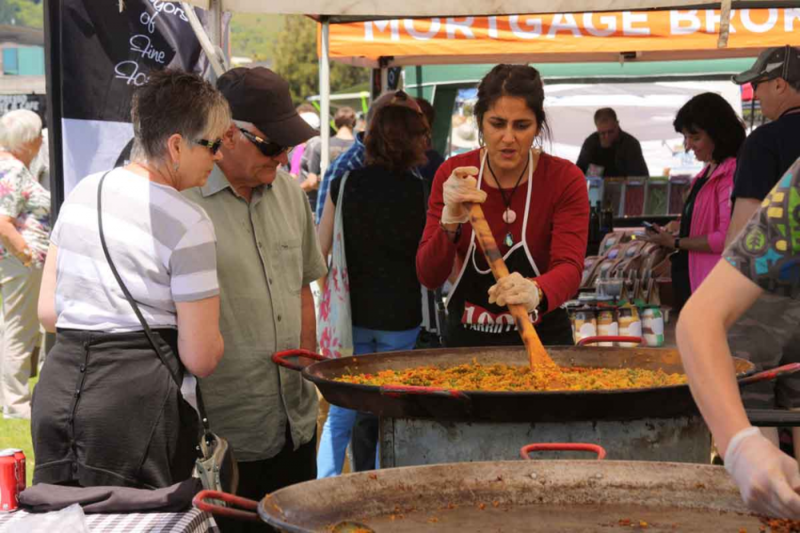 The Kapiti Food Fair is getting ready to close vendor registration with 185 sites booked. “We are really excited by the increased interest from last year (158 sites) as it confirms our belief the Fair is becoming anchored in to vendor planning as a significant event,” says Helene Judge, co-owner of the Fair. “The variety of vendors this year is exceptional and we are continuing to attract new ready to eat and packaged F&B products which adds to the variety of sites visitors are expecting to see at the Fair,” says Jeanine, the other co-owner of the Fair. “Our marketing tactics are nearly in full swing will many billboards going up early in November including a large digital one in Otaki which is exciting,” says Helene. We are also activating a digital campaign along with cinema advertising in Levin, Paraparaumu and Reading Cinema Courtney Central. Wellington bus backs will be promoting the Fair and we have a huge 10m banner going up on the Jervois Quay Overbridge which we hope will be seen and acted upon by hundreds and thousands of people. Kapiti Kruzer will be running a FREE hourly bus circuit from the Paraparaumu Railway Station to the Mazengarb Reserve this year. This service will work for anyone coming from Wellington or Waikanae who want to reduce their carbon footprint by leaving their car at home for a wonderful foodie day out. “We have two entertainment zones this year,” says Jeanine. The main stage under stretch tent includes jazz, blues, funk, pop, folk, classic rock & kiwi tunes, covers from the 60s to now, original music and youth musicians. The second area is a busking zone being anchored by the ZEAL Music Box with a variety of performances by professional and amateur buskers. This area is likely to be attractive to the younger visitor. “The Celebrity Chef demonstration menus with Jax Hamilton are all but finalised and are sounding delicious,” says Jeanine. We do have three tickets remaining to sell to attend the Masterclass with Jax on Friday 1 December – “please phone me if you are interested in one of these tickets or go to our website,” says Jeanine. The Tuatara Bar is working hard behind the scenes to be serving craft beer, boutique wine and a special Fair cocktail from those vendors who have sites at the Fair. “The Bar is BYO food and will welcome everyone including kids as long as they are accompanied by a parent or guardian,” says Corey Taylor of Tuatara Brewing. We are brimming over with excitement to deliver on our Mission of being a “fun and tasty day out for all foodies that fills your life with good friends, good times and good food,” says Helene. We look forward to seeing many more visitors this year at the Fair >> Saturday 2nd December 2017, 10am to 3pm, Mazengarb Reserve. Kapiti Food Fair is sponsored by Air New Zealand, Bayleys Real Estate Wellington, BCE Catering Equipment, Greenmantle Estate, Kapiti Business Projects, Kapiti News, KOAST Limoncello, PartyPerfect Catering, The Hits and Tuatara Brewing. Kapiti Food Fair is a current recipient of the Kapiti Mayor Events Fund and supported by numerous local business including Kapiti Rotary. The Fair is privately owned and operated in partnership by Kapiti Business Projects and PartyPerfect Catering. Original generation time 1.4399 seconds. Cache Loaded in: 0.0192 seconds.